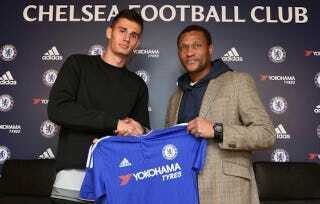 Chelsea’s newest and hottest prospect, American center back Matt Miazga, has been in London for barely over a week and he’s already reshaping the club. First, John Terry announced that he’d be leaving Chelsea at the end of the season, no doubt out of fear that the young phenom behind him would eat up all the available minutes in the Blues’ back line. Now, it’s Radamel Falcao who’s been sacrificed for Miazga’s benefit, as the defender has been added to the club’s Champions League squad while the striker has been taken off. Slowly but surely, Chelsea are clearing out the clutter on their roster so as to better integrate the man who will surely be a foundational piece of the team going forward. Wrong. It’s you who knows nothing. Pato’s just a six month rental, likely a cheap bargaining chip to convince Falcao to take a Jackson Martínez-like deal in China and get out of Chelsea’s hair. Miazga is real. Miazga is the future. Get with it or get left behind.